The first meeting of the year drew in a record number of attendees as compared to previous years. I believe we counted over 45 magicians (both members and non-members). President Fred Rasmussen introduced the new Officers of the 2011 administration (President Fred Rasmussen, VP Cal Tong, Treasurer Will Chandler, Secretary Raahul Srinivasan, and WebMaster Bill Benson). After the business section of the meeting, Vice President Cal Tong introduced the lecturers of the evening: Dan and Dave Buck! Dan and Dave are known for their Lessons on sleight of hand Card Magic and Card Flourishes. They lectured on modern card tricks and Flourishes which Dan and Dave are famous for along with a plethora of new material. Many folks may not know this, but Dan and Dave Buck were members of IBM Ring 216 over 15 years ago. Thank you Dan and Dave for making our first meeting of the 2011 year a success! In addition to the Dan and Dave Buck Lecture, Shoot Ogawa was in town and provided one on one coaching and mentoring. A few of us took advantage of this great opportunity to study from this master sleight of hand / champion magician from Japan. I would highly recommend Shoot Ogawa for those interested in improving their routines, techniques, and elevating the impact to their magical effects. Magic & The Art of Success" was a 2 hour event during which Wayne Houchin performed and shared a handful of his favorite pieces of magic, including magic that can only be seen during his live show. A wide variety of material was discussed including mentalism, geek magic, sleight-of-hand and impromptu miracles - and featured both close up and stand up magic. Wayne covered magic using sewing thread, coins, matches, soda cans, cards, body parts and more. Character development, goal setting, and "The Art of Success including Why Magicians Fail" was also discussed. IBM Ring 216 continues to attract the most talented Magic Lecturers and magi visitors. Please take a look at our web site;s "Future Events" section for other great lectures and exciting events soon to come! The group (all prepared with some effect to show) was split into small groups of 4-5. Then each person in the group got 15 minutes to share their effect and get feedback/criticisms. Everyone walked way with some performing experience as well as some positive criticisms/feedback on their routines. David Clavens presented a mentalism mystery by revealing the contents of three envelopes prepared by three different spectators. IBM Ring 216 held a lecture by Howard Hamburg. Howard Hamburg was the hit lecture at the Golden Gate Gathering Magic Convention in 2009 where his "D notes" sold out nearly instantly. Over his life he was friends with Dai Vernon, Charlie Miller, Bruce Cervon, Larry Jennings, and Alex Elmsley to name just a few. In addition to the stories Howard tells about these legendary men, he is an extremely knowledgeable card man with work on a deck that will slaughter laymen and magicians alike. In the month of June, Ring 216 held its annual auction and flea market. A very special thanks to Jim Mullen for his generous contribution of magic sold at the June auction which made over $150 for the club. The many members and participants who bought items will surely enjoy this magic. Ring 216 would also like to thank Jim Mullen for his donation of a P/A and Microphone System which was also used for announcements at the auction. All the Officers and Ring members wish Jim the best in his move and new home. IBM Ring 216 Magic Teach-In Members enjoyed our “Magi to Magi” event where magicians were divided into small groups of 4 people, performed a short routine, and received feedback for their performances. Each member also observed several performances in their small group and provided their Magi brothers and sisters valuable feedback on their performances. The evening ended with “Open Performance Night.” Suresh performed a safety pin trick and the torn and restored thread routine, John Jones performed one of Daryl’s popular card effects, Stan performed a rope escape, David Clavens performed a three phase mentalism routine, and Raahul Srinivasan performed his Magic Garage Close Up routine consisting of his personal ball and vase routine, the slapping card act, and a multi-phase oil and water routine. Competition. Vice President Cal Tong was the Master of Ceremony and introduced the 7 skilled and seasoned competitors (Alan Leeds, Raahul Srinivasan, John Jones, Fred Rasmussen, David Clavens, Theron Schuab, and Aldrian Estepa) to the excited audience. After a brief run down on the voting process and competition rules, the audience was divided into 5 performance stations which consisted of a variety of audience environments (seated, standing, with table, and without table). Each competitor performed their amazing routines at every station, and the M.C. Cal Tong video diligently video-taped the competitor’s fantastic performances for later viewing and feedback. Alan Leeds performed a very engaging rope routine and card magic; Raahul performed exciting card magic and a coin effect; John Jones performed amazing card magic; Fred Rasmussen performed a very visual 3 coin vanish/production, a chop cup routine, and a torn and restored picture effect; David Clavens performed a unique M&M prediction effect, entertaining card magic, and a surprising smoke effect; Theron performed a coins-in-pocket prediction, skillful card magic, and a dazzling dice mentalism effect; and Aldrian performed eye popping coin magic, card magic, and a fun sponge ball routine. At the end of the evening, Vice President Cal Tong announced the Ring 216 Walk Around Competition winners. 3rd place was awarded to Alan Leeds, 2nd Place was awarded to David Clavens, and first place was awarded to Theron Schuab (current Ring 216 Sergeant at Arms). We are excited to host Dorian Rhodell as our 4rth professional lecturer at IBM Ring 216 in 2011! This will be a relatively broad lecture and not focused in any one medium. It is designed to impart advice that can be applied to any branch of magic. For example, choosing the right sleights to use in an effect and how to eliminate or circumvent tells (actions that tip off that something is about to happen) in the work we already do. Dorian will cover some of his card material from his recent DVD release, his coin work, bill switch, and other material. Much of what Dorian has learned has been passed down to him by way of five mentors; Jon E. King, Jerry Camaro, Paul Chosse, Larry Jennings, and Ron Bauer. Dorian has been given permission to teach some of Ron Bauer's material and will be going over a couple of items of Paul Chosse's. Member Cost: $15, Non Member Cost: $25, Time: 7:30pm, For address of location, go to www.ring216.org. Email vicepresident@ring216org for additional questions. 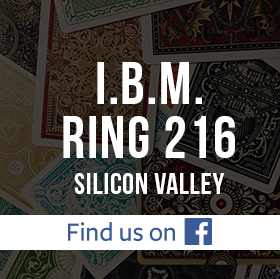 This was the second of three friendly IBM Ring 216 magic competitions. Many thanks to Treasurer Bill Benson for coordinating this event. Competition Performers included Aldrian Estepa, Alan Leeds, Calvin Tong, David Clavens, and Raahul Srinivasan. Aldrian Estepa performed sponge balls, sponge ball to cards, color changing cards, several coin routines, and a jumbo coin finale. Alan Leeds performed several amazing card magic effects. Calvin Tong performed an Invisible 3 Ball routine, 4 Coins to Glass with a 2 Jumbo Coin Finale, and a Mentalism Dice Routine. David Clavens dazzled the audience with his close-up mentalism including an fantastic ball under Styrofoam cup effect, several card revelations, a book test, and a name revelation finale. Raahul Srinivasan performed a wonderful multi-phase Oil and Water Card routine culminating with a full deck separation and ended with a with a peanut butter and jelly sandwich production (you had to be there). All the performances were outstanding. After the ballots were calculated, Bill Benson announced the winners: Aldrian Estepa won 3rd place, David Clavens won 2nd place, and Calvin Tong won First place. Ring 216 held its annual Stage/Parlor Magic Competition, the 3rd and last friendly competition for the 2011 year. Vice President Cal Tong gave a short speech on his excitement as Ring 216 President Elect for 2012 and informed club members that he will be reaching out to each club member for feedback on “improving the club.” As the Master of Ceremonies for the evening, Cal Tong introduced 4 skilled competitors to the awaiting audience: Mysterious Stan Jacobson, John Jones, Joe Caffall, and Aldrian Estepa. Mysterious Stan kicked off the competition with a Metamorphosis Escape with the help of his assistant Gina. John Jones entertained club members with a Magical Silk Effect, a 3 Fly Coin Routine, and Selected Card Revelation. Joe Caffall amazed the audience with his Needle through Balloon Routine, a Selected Card Revelation, and a Torn and Restored Card Effect. Aldrian Estepa closed the competition with his personalized Coin Manipulation Act and a Four Ace in Glass Card Routine. While the results were being tabulated, Fred Rasmussen lead Open Performance Night with a Card Routine where U.S. money and land assets (card faces/backs) disappeared in a U.S. debt crash, but slowly returned to full value. Sy Hoffman performed E. Burger’s Thought Sender. Sohom performed a 3 Card Revelation Routine. At the end of the evening, Vice President and Master of Ceremonies Cal Tong announced the following Ring 216 Stage/Parlor Competition Winners: First Place - Joe Caffall and 2nd Place -Aldrian Estepa.